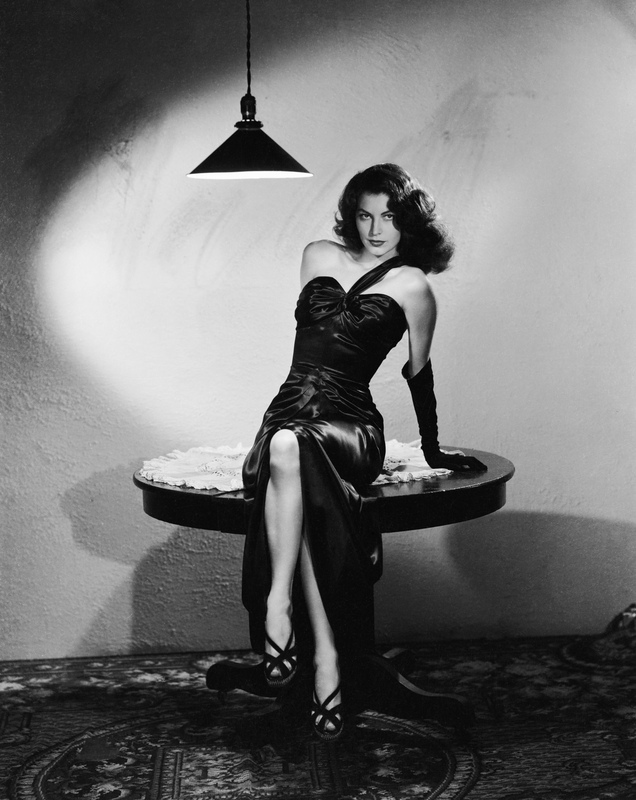 This entry was posted in 1940s, Blog Events, blogathon, Film Noir, noir, Uncategorized and tagged ann savage, ava gardner, bad girl, barbara stanwyck, beauty, costume, decoy, design, designer, detour, double indemnity, edith head, fashion, femme fatale, film noir, gene tierney, glamour, gloria swanson, hollywood, jane greer, jean gillie, jean louis, lady from shanghai, lana turner, leave her to heaven, maltese falcon, mary astor, noir, nostalgia, orry-kelly, out of the past, postman always rings twice, retro, rita hayworth, style, sunglasses, sunset boulevard, the killers, vintage by Nitrate Diva. Bookmark the permalink. I love the clothing in Leave Her to Heaven. I noticed once while I was watching that many of her outfits had shades of green or mint in them. Maybe for jealousy? And her outfit where it had the monogram at the top-maybe showing how selfish she was? Excellent observations on what sets film noir dames apart from the rest. Love it. Love, love, love this post. The thoughts on Kathie Moffat in Out of the Past jibe with my own impressions of the film. Great work. Fantastic post! You bring up very interesting points about accessories in particular. With many of these characters I’ve been so in awe of the garments themselves that I’ve never paid much attention to the accessories (with the exception of sunglasses, which are pretty hard not to take note of — especially when worn indoors like Phyllis or Norma!). I loved this! I’m so glad you incorporated all these fabulous femme fatales and their wardrobes..
Great post – really, really well done! There is no doubt that anklet is the best noir accessory of all time, but I think Norma Desmond’s crazy cigarette holder that wrapped around her finder was a close second! I was getting nervous that you would not include Lana Turner, but – hooray! – there she was! Al great choices. Nice shout out to Gene Tierney in Leave Her To Heaven. Her outfitting was just as fierce as her calculated, plotting persona. Fabulous post! I’ve always loved the costumes worn by femme fatales because they can be so outrageous and, like you said, often feel very calculated. Another movie that made great use of the color white as a disguise for guilt was The Letter. Not only does Leslie wear quite a bit of white, she also works on making that white lace throughout the movie, which I think is a great symbol for how she’s very carefully trying to create an image of innocence. And the fact that Leslie has the nerve to wear white and drape herself in white lace when she goes to get the letter back from Mrs. Hammond makes her one of the ultimate femme fatales in my book. Fascinating piece – especially interested in your comments on the use of white as a disguise, and the way Kathie’s clothes change in ‘Out of the Past’, since I saw that one very recently. This will be a posting to return to as I catch up with more femmes fatales and noirs – you have given a lot of food for thought.